Vouchers are great tools to use to increase sales as it provides your customers with a means of gifting your product or services to the people they love. 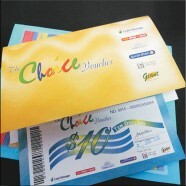 We can print personalized gift vouchers for your business. We pride ourselves that our custom printed vouchers are full of colour, and printed on high quality paper, with 2 tear-off perforated stubs or single sheet for your convenience. All you need to do is choose your design from some free stock websites like, www.freeimages.com or www.flickr.com/creativecommons and customize it to your requirements using simple web based editor. Of course, you can always design your own voucher as an image, PDF or DOC and send it across to us for printing. It is our aim to make voucher printing so easy and affordable for you and we are willing to even give you a no obligation proof of your personalized voucher design. As we have no minimum order quantity, you can try them out yourself to see how they benefit your business.